Maryland is a state in the mid-Atlantic region of the United States of America. It is on the south east of the East Coast. Its capital is Annapolis, and its biggest city is Baltimore. The governor of Maryland is Larry Hogan. He was elected in the 2014 election. Hogan was re-elected during the 2018 election. The state bird is the Baltimore Oriole. The state flower is the Black-eyed Susan (Rudbeckia hirta). The state reptile is the diamondback terrapin. The state crustacean is the blue crab. The state motto is Fatti maschii, parole femine, which is Italian for "Manly deeds, womanly words". Maryland is the only state with a motto in Italian. Maryland has many places important to the American Revolutionary War, the War of 1812, and the American Civil War. One of these places is Fort McHenry, which defended against the British Empire during the War of 1812. Another place is the Antietam National Battlefield, where the Battle of Antietam took place in 1862 during the American Civil War. Silver Spring, Bethesda, Gaithersburg, Rockville, Frederick, Hagerstown, Cumberland, Salisbury, Greenbelt are other cities. Founded by English Catholic settlers who wanted a place where they could freely practice Catholicism, Maryland was the seventh state to join the US. 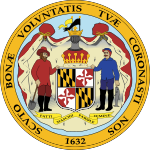 Maryland is known as the "Old Line State," named after the Maryland Line, a regiment that fought in the American Revolution. Maryland surrounds most of the Chesapeake Bay, and the state is known for its Crabs and Crab Cakes. Baltimore, the largest city in Maryland, is a major city that is home to the National Aquarium, Fort McHenry, and the Camden Yards baseball park. Annapolis is very famous for being the home of the United States Naval Academy, one of the flagship service academies in the United States. This page was last changed on 16 April 2019, at 16:36.